Today marks my first game since the home opener; life and work (and the Mariners schedule) has gotten in my way, but today I will be going to watch Felix start against the Kansas City Royals and Kris Medlen, who I am unfamiliar with. I am wary of the World Series winners; I mean, for one thing they won it all last year, and for another, I’m not all that familiar with the Royals’ roster this year, and even though the Ms have been doing a lot better this year, we still seem to struggle a lot at the plate when Felix pitches. I don’t know if there is any sort of correlation with Felix losses and no-decisions and our offense. It’s entirely possible that players allow Felix’s ace status and the pressure to win because of it to get in their heads, but it’s also possible that I’m full of it, and the entire situation is simply one massive ugly coincidence. I’m going with the latter because the former makes me sound crazy. Anyway, here are three pictures. 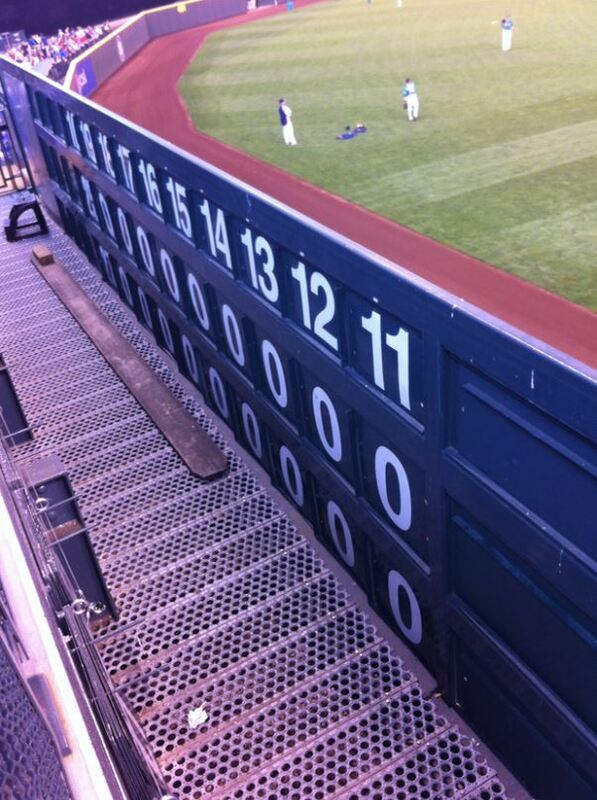 Behind the manual scoreboard in left field. Taken while hanging out on the party deck at Edgar’s Upper. I have known people who have worked back there, and it still doesn’t make any sense to me how they can see the game (there are small holes in a lot of the manual boards, but that still seems like a very small view). At Safeco of course, they can just look off to the side and see MarinersVision tell them what happened; but how they handle it at other parks where that vantage point is not feasible will remain a mystery to me until it’s not anymore. I haven’t yet decided whether I want the magic ruined for me or not. 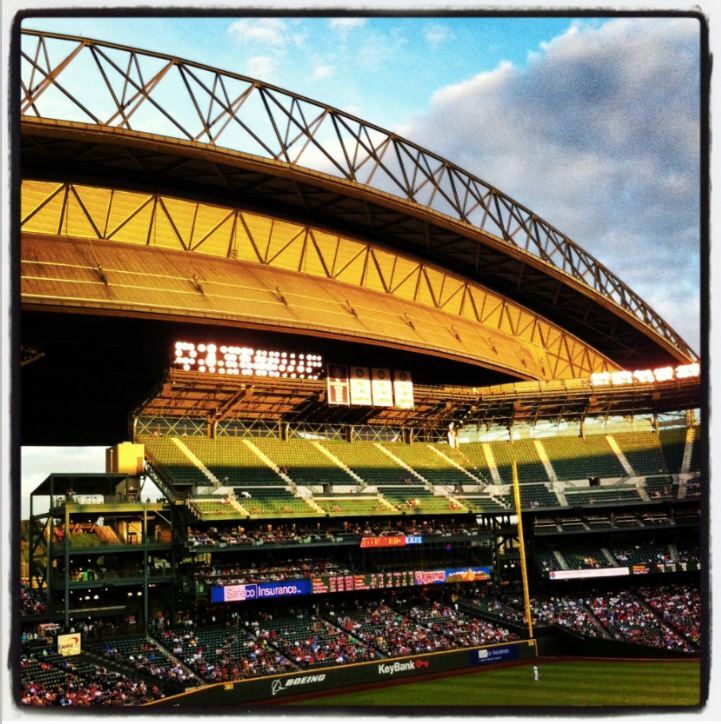 The sun goes down over the Mariners. An Instagram shot taken several years ago. It always amazes me, even still, how big and yet how small our park seems. A living room with 30,000+ of your closest friends. Shaking hands after a victory. 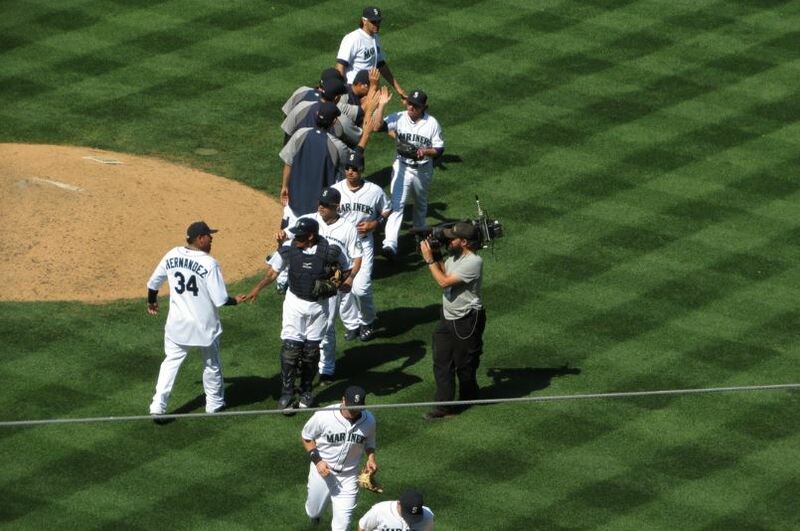 Unsure if it was a Felix win necessarily, but since he is in the shot, I wanted to use it today. The King’ s Court will be in session tonight, and I am looking out the window at work and wondering if the sweater I’m wearing and the sweater I brought will be suitable enough for tonight’s weather. All I know is that I’m looking forward to my first regular season game, the company I will be keeping for it, and the possibility of getting to see some Steve Cishek stadium light drama when there is a game on the actual line, rather than a tied game in the top of the 9th and a closer brought into the game for no reason. Also, my friend Cynthia and I (my buddy Dee is sick and cannot make it this evening) plan to give the new grilled cheese stand a try out for dinner tonight. But first, I have to slog through three more hours of work.